Every Fall, Toys for Tots brightens the Christmas seasons of local children in need by ensuring that they all receive presents and holiday cheer. It is a nationwide effort run through the United States Marine Corps Reserve, and draws on local volunteers to meet its requirements. 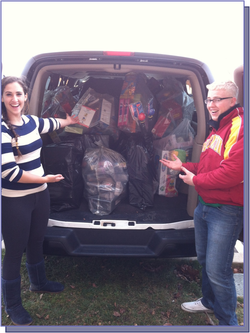 Every year the NROTC Battalion is involved with many steps of the Centre County Toys for Tots program, including toy collection, transportation, sorting and wrapping. The Marine Options take the lead in organizing the effort, but all students participate. The result is amazing. Thousands of toys collected from around the area fill up huge rooms in the Penn Stater Hotel and Conference Center, where they are organized, sorted, wrapped, bagged, and sent out for distribution.